Many storage architects wonder what kind of performance improvement they can realistically expect from flash storage, and how much more it will cost. For the first time, a detailed comparison is possible by simply spending 10-15 minutes answering the questions posed by TCOnow! for Flash. Using a combination of empirical data and sophisticated modeling, TCOnow! automatically generates a detailed business case report with the performance and cost data needed to make the optimal storage purchase decision. This accelerated analysis is made possible because TCOnow! contains state-of-the-art performance models, innovative new storage workload design models, plus the design rules and pricing data for more than 100 different arrays. In addition, a country- and region-specific cost database is included for items such as rent, electricity, employee benefits, tax rates, etc. As a result, TCOnow! 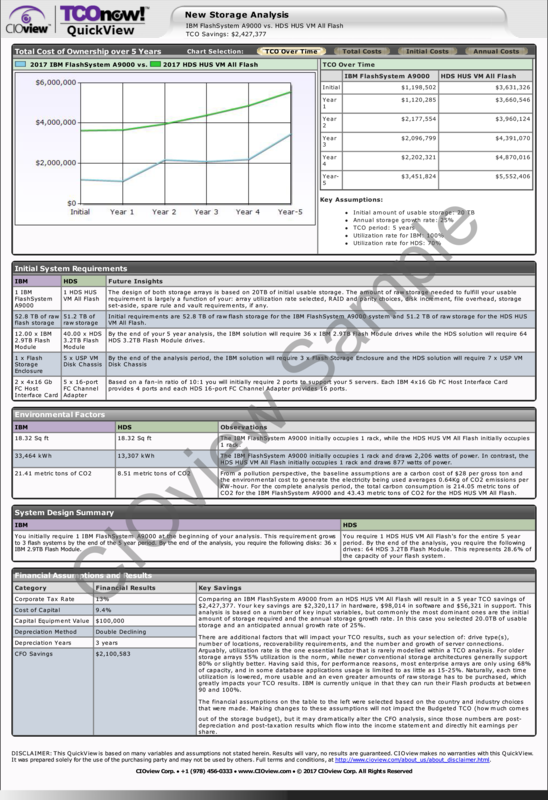 provides a default answer for every question posed during the performance and TCO analysis, and an easy way to change each response if you have empirical information available. Combining TCOnow's performance model, with its database of costs and its sophisticated inferencing engine, means once you have completed your preliminary assessment you have access to a series of "what if" analysis options. Now, you can test what level of short stroking would be required to meet your performance needs, and what the cost would be compared to an all-flash or hybrid solution. Even the performance and cost of different drive and RAID options can be rapidly analyzed. TCOnow! 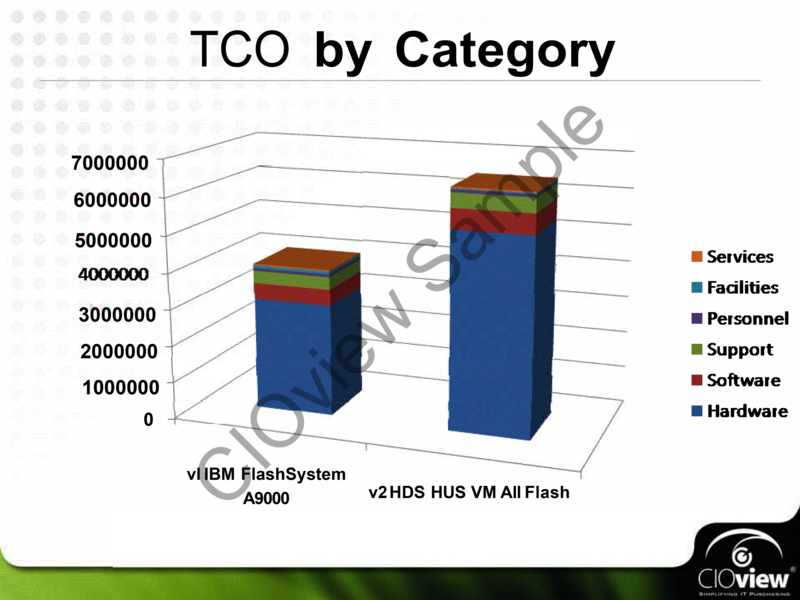 for Flash allows you to design and compare the performance as well as the True or Total Cost of Ownership (TCO) of two quite different customer scenarios: an "existing storage environment to a new one" where you compare FlashSystem to a conventional array, or a "new to new" situation such as an IBM FlashSystem versus Dell EMC XtremIO. In a "new to new" comparison, the IBM solution can be a pure IBM FlashSystem, or a FlashSystem hybrid. Either of these can then be compared to new flash products or conventional arrays from EMC, Hitachi Data Systems, Hewlett-Packard, NetApp, Violin Memory and Pure Storage. In the case of an "existing to a new" storage solution the existing system can be any conventional array from IBM, EMC, HPE, NetApp and Hitachi compared to a new IBM FlashSystem or FlashSystem hybrid. TCOnow! 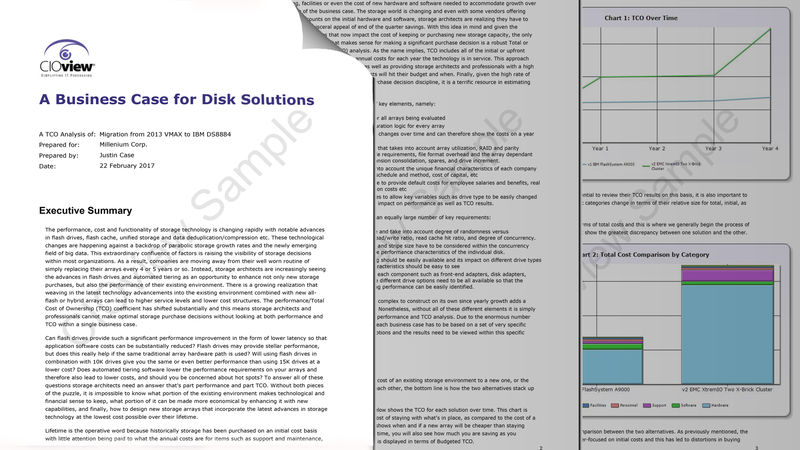 shrinks a typical multi-week disk analysis project into a matter of hours. This accelerated analysis is made possible because CIOview's software is packed with data and algorithms on disk arrays, flash drives, advanced functions, and management software. If you want to avoid being hit by hidden fees and disk.